"We all have a place and we've got to keep to it. It's not no use pretending otherwise, is it." 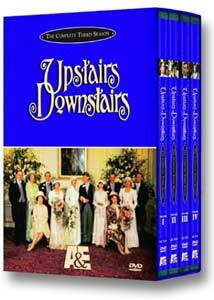 With its third season, Upstairs, Downstairs abandoned the original concept of keeping the series situated in the Edwardian era. With the king's death closing season two, the third moves forward 2 years to pre-war 1912. Substantial changes were afoot in the cast, with Pauline Collins and John Alderton moving on, and Nicola Pagett, who had played Bellamy daughter Elizabeth, leaving the series over her exclusion from a planned Upstairs, Downstairs feature film. Afraid of being type-cast for her strong role as the mother of the household, Rachel Gurney also makes her final appearance as Lady Marjorie, returning only for the first episode to explain the character's departure. With the young adventuress in Elizabeth, and the matron of the house gone, new blood was brought in to keep the character set balanced. Meg Wynn Owen comes aboard as Hazel Forrest, a woman faced with the dilemma of being an Edwardian woman—neither an aristocrat nor in service—she assumes a role as a professional typist, placing her in a netherland of social standing, eventually becoming James Bellamy's love interest. To fill the void left by Elizabeth's departure, Richard Bellamy gains a ward in the young Georgina Worsley (Lesley-Anne Down), whose development in the changing times that have preceded her stay have left her without the strict adherence to class distinction her elders have, adding to the internal conflict within the house. With Georgina's arrival, the servant staff will see the appearance of Daisy (Jacqueline Tong) midway through the season, adding a love interest for Edward (Christopher Beeny), and sparking an undercurrent of jealousy in Ruby (Jenny Tomasin). The show's budget also increased with its popularity, allowing more use of location shooting than had previously been seen, including an impressive manor that forms the backdrop for several episodes, and even a fox hunt. There are also a number of new sets to be seen throughout. Scandal and more major household upsets continue to keep the stories lively, and the historic backdrop against which the series plays will find several important inclusions as the show progresses. The script writing is excellent, and the episode quality is fairly even. There is a lot that goes on through suggestion and below the surface, which is enacted well by a very capable cast and great direction. This season of Upstairs, Downstairs continued to see its share of industry recognition, awarding producers Rex Firkin (executive) and John Hawkesworth Emmy Awards® for Outstanding Drama Series, Jean Marsh an Emmy for Lead Actress in a Dramatic Series, and Angela Baddeley a nomination for Outstanding Continuing Performance for a Supporting Actress. Director Bill Bain, also won an Emmy® for Outstanding Direction in a Drama Series for The Sudden Storm. The stories also build on each other, keeping the serial nature intact. There are a few great twists to be had this time round, and I would warn of the extreme spoilers to be found on the packaging synopsis, which I have tried hard to avoid in the summaries below, though they may not be entirely spoiler free. While his parents are away for the weekend, James makes a play for his father's new secretary, Hazel Forrest. When ordered to set luncheon for the two of them, Hudson deems it improper and gets a dressing down by the young master. The fallout prompts Hudson to serve notice and an air of unease settles on the household only days before Lady Marjorie's departure for a two month voyage to North America. The Marconigram that concludes this episode foreshadows an ominous turn of events. There is a notable amount of time code bleed and hiss in this episode. Tragic news reaches Eaton Place, and the repercussions are manifold. In Lady Bellamy's absence Miss Forrest is charged with attending to the upper house details, much to the resentment of the downstairs staff. Coping with the news of the day takes its toll on the household, but no one is prepared for who shows up at the door. Patsy Smart delivers an excellent performance here. James heads to Sommersby Park, a great manor house in the country, for a spot of shooting, taking Hudson as his valet and loader. James had been invited to keep a young woman company, but his attentions are directed elsewhere—the woman his host had intended on proposing to that weekend—and some of the other house guests find sport in the romantic possibilities. Meanwhile, Hudson finds himself stepping into the place of house's butler, and is offered the position as a result, putting his loyalty to Eaton Place to the test. Much of this episode is shot on location. James' pursuit of his father's secretary takes a more serious turn, an event neither Richard Bellamy nor the girl's mother are receptive to. Downstairs, the staff are in a somber mood as they reflect on the changes that have occurred over the past six months. When word reaches the servant quarters about the upstairs affairs, Rose has her own ideas as to what has transpired. An interesting look at the changing attitudes towards women in society, and what is deemed "acceptable" in good society. Rose discovers the Bellamy's former footman, Alfred, skulking and soaked to the bone outside the servant's hall. Due to the circumstances surrounding his departure, Rose tries to hide his presence from the rest of the staff, but Hudson discovers her misdeed. Alfred's tale of a forbidden love affair with his previous employer's niece gains the sympathy of the servants, but when Hudson informs Richard Bellamy that the man is in the house, the truth of his circumstances comes out. A fairly bold episode for its time, given the nature of the subject matter. Hazel receives a call from a Countess de Tourney, who claims to be an old acquaintance of Richard's, and is invited to a dinner at Eaton Place. Edward uncovers the truth about the visitor, who is notorious in some circles for her reputation as a charlatan and a gold digger—and she is after Richard and the money she thinks he has. A new underhouse parlormaid arrives in Gwyneth, who seems highly qualified, and is also full of gossip—and a fervent imagination. Janet Lees Price gives a spirited performance as Gwyneth Davies. Richard earns himself a diversion. Richard is given a confidential tip on a stock opportunity. Their sensational appreciation may mean financial independence for him, but the transaction raises a scandal in the Parliament, with Bellamy at its center. His only chance to clear his name would be to divulge his adviser, a move that would dishonor his word. While perhaps not the most action-packed episode, this firmly establishes Richard's moral dilemma and strength of character, and also that of others in the cast. Hazel is apprehensive about her forthcoming weekend at Sommersby with James, and the company of a class of people she has no familiarity with. Rose will provide her guidance as handmaid, and Edward is enlisted as James' valet, a role he, too, is unfamiliar with. Adventure lurks in the hallways—and bedrooms—of the manor house, taking its first time visitors offguard. The fox isn't the only thing being hunted this weekend, but a gag by the host's wife sparks a rift between the Bellamys, especially when Hazel learns of the customary diversions a country weekend entails. His work on this episode earned John Hawkesworth an Emmy® nomination for Outstanding Writing in a Drama Series. It's Christmas at the Bellamy residence. Lady Southwald arrives at Eaton Place for the holidays, as does Richard's 18-year-old niece, Georgina Worsley. She befriends the new underhouse parlormaid, Daisy Peel, who is also her age, but Rose is concerned by their familiarity. Hearing that Daisy hadn't seen her family for years, Georgina hatches a plan to raid the larder and pay a surprise visit to the rough end of London, but she's not prepared for what she'll find. Back at the house, their mischief causes quite an upset in the process. The extremes contrasts of English society have some light shed upon them here. Edward's loose tongue at the pub about what he'd seen while visiting Sommersby puts him smack in the middle of a divorce proceeding that will be the ruin of an upstanding young member of the Conservative party, whom Richard admires. The senior Bellamy acts as intermediary with his house's reputation also on the line. Downstairs, the younger servants are confused by the hypocrisy of the morality they are expected to live up to, and the actions of their masters. Rose falls head over heels in love when she meets an Australian sheep farmer on the tram. Events move quickly and within the week Rose is engaged to be married—and will be sailing to Australia. While the women of the household are happy and supportive, the men don't share their optimism and are highly suspicious of why a seemingly wealthy man should choose a servant for his bride-to-be. Rose finds a well deserved suitor, and has her dilemma of abandoning the country and all she knows for the hope of a better, and more respectable future out of service examined. Unable to face his wife after she has suffered a miscarriage, James is paying inappropriate attention to his young cousin Georgina, which Richard's suggestion that she accompany James to a ball does little to diffuse. Downstairs, Ruby is put in charge of kitchen, a responsibility she is not the only one to hope ends soon. James' inattentiveness on his wife's behalf does not go unnoticed by the other members of the house, but the atmosphere grows extremely tense, and may have serious implications to the living arrangements in the Bellamy household. Undercurrents abound as the close quarters are affected by the hot and humid climate. Disillusioned with their marriage, Hazel contemplates her future, one that both she and Richard have regrets about, while downstairs, Mrs. Bridges has a suitor. The atmosphere in the country is rife with the growing tensions in Europe, as debate about England's possible involvement in conflict grows. With the Bellamys to be away for the Bank Holiday, Hazel suggests the servants be treated to a vacation, which they take at the beach, but news that Britain will soon be at war sets a mood of national pride and optimistic jubilation in the air. The naïveté of the younger generation to the prospects of war, and the lack of foresight as to what will be the result of the events transpiring in their world are fascinating. From a scepticism that England will even be involved in Europe, to an embracing of their commitment to the battle shape an exceptional episode, much of which is shot on location. Image Transfer Review: Like the first two seasons, the video quality here is far short of spectacular, due to the condition of the source elements which have not fared well over the years. Shot on video in the early- to mid-1970s, the image has degraded significantly in the intervening years, though in fairness to A&E, they do make mention on the outer box to expect a subpar presentation. Through the course of the 11 hours here, but not at all times or in every episode, there is every manner of defect, from major dropouts and stutters, to weaving or banding in the image. Colors are undersaturated and the hue tends to green throughout. The appearance is murky most of the time, and several episodes are overly dark. The image is generally soft, with pronounced bleeding, unevenness in density, and the occassional flaring on hot whites. This series has never looked great on broadcast, but it is a shame that such great work should be allowed to deteriorate like this. The transfer doesn't seem to add anything more detrimental to the source than is already there. Audio Transfer Review: Audio fares better than the video, but does contain its share of deficiencies. First and most frequent is excess hiss. Distortion is limited to a few areas, and two episodes have a fair amount of time code bleed in them. There are a few dropouts which coincide with a video anomalie. Dialogue is usually pretty easy to discern, though all of it was captured on location, so some is a bit fainter than others. If you have been watching the previous seasons, this is more of the same in terms of quality. Extras Review: There are no extras to speak of, however spoilers abound in the menus and on the packaging. The main menu has a central motion video window, with top level access to the episodes. A second menu allows individual chapter selection, with six chapters per episode. The four cases are housed in a decent purple box, like the first sets. I'm not sure where the images online get their hot blue color. I question the selection of images that are featured on the box and disc covers, as they are not from this season. The third season of Upstairs, Downstairs continues to deliver superb period drama, supported by an exceptional cast, and exquisite stories. The only disappointment is the sorry state of the source elements for this release, otherwise I would have no hesitation in giving this my highest recommendation. If you have been enjoying the series to this point, you know what to expect. The quality of this program makes it fairly easy to overlook the technical shortcomings. I'm just thankful to be able to experience this again.